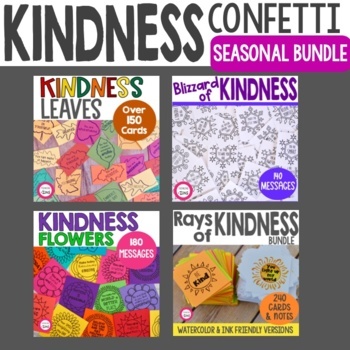 Seasonal Kindness Confetti Cards for all seasons. Fall leaves, Winter Snowflakes, Spring Flowers and Summer Kindness Suns. Spread Inspiration, positive messages, compliment cards, gratitude and kindness throughout the year. PLEASE NOTE: Cards are TINY in size. Most are small square cards which measure approximately 2 in x 2 in. The Kindness leaves also include some rectangle shaped cards which are also very small. The majority of the messages are repeated for each season- they are created to spread similar messages throughout the year with the change in seasonal theme with the clip art.